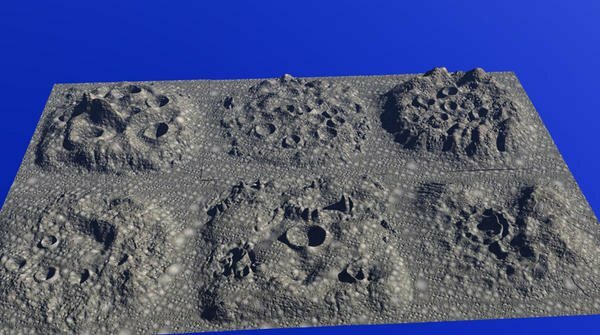 Being a bit of a Sci Fi junky I just looked at part one of a three part tutorial on making a Moon Surface in Vue at geekatplay, I thought It might be possible to transpose the techniques, but found it was a bit more than I can understand. Does anyone know if there is a Moon Surface tutorial in Bryce? Are you looking for something like that: http://www.bryce5.com/details.php?image_id=578 - not very good, made it 8 years ago. Being into the Moon also, I've never come across a tut., on creating moon surfaces, however, it is possible, and quite easy. Once you have a lunar grayscale DEM, it's simply a matter of replacing a terrain mesh with the DEM. That is, in Bryce, create a terrain, click E, goto picture tab. In the first thumbnail box (on left) click load, choose the DEM you have in your own computer file, then do the same again for the second thumbnail box (in middle), finally, click apply. Done! You can afterwards apply a Bryce terrain mat on top of it, or use any of the mats available. The only problem with Byrce terrains, in general, is that you can't produce a curved terrain to follow, say, the curved circumference of a planet. There is a small workaround where one can apply a small curvature to the terrain (won't go into it right now), but doing so lowers the terrain, and, really, it doesn't suit if you want a whole realistic planet with raised terrain, mountains etc. that you might want to zoom in on with a camera etc. For a curved horizon, there is always the possibility to use a lens in front of the camera. Yes Horo that's very close to what I was looking for. Sorry for being dumb, but what is DEM ? Oops, sorry. DEM stands for Digital Elevation Model, and what it essentially is is a grayscale representation of a terrain’s surface and elevation; where the various shades of grays to white to blacks have been calibrated to a particular elevation. So, one shade of a lighter gray might stand for 20 m in elevation, another darker shade of gray might stand for 10 m in elevation, a darker shade again might stand for 5 m...etc., You get the drift. White in the grayscale are usually the highest elevations, while blacks the lower. It’s similar to what Bryce is doing with their terrains, in that, when you create one, they are giving you a grayscale version. Only difference with the DEMs is that they are calibrated, that is, the colours (grays to white to blacks etc.,) all have been allocated specific elevation values according to the different shades. This is just the technical side to DEMs, however, I think they might still be what you’re after for use in creating simple lunar terrain that doesn’t require any specifics. So in that case, they would be ideal for you, as you can still play around with reducing the elevations, or adding several DEMs together (if Bryce doesn’t crash in the process). The DEMs are all in 16-bit format, so they are ideal, because if you go any lower to, say, 8-bit, then they are useless; if you want to avoid ‘stepping’ effects. Images below might give you an idea as to the power of DEMs (top is an example of a DEM, bottom two shows a Bryce terrain mat overlaid on it, each from different camera views. Here’s a link to the lunar DEMs (http://imbrium.mit.edu/BROWSE/LOLA_GDR/CYLINDRICAL.html). Yes, quite correct, and there's another option of creating a rounded Bryce terrain and adding it into the terrain. But, they still aren't suitable, in my opinion. Good. I did that moonscape with the help of a tutorial. I'll try to unearth it when I get home. Those interested can get it by clicking on the link. It won't stay there forever, better act now. Horo, those are quite nice renders, too...I recall seeing your Mars’s render before, which still have got a great atmospheric feel to them. 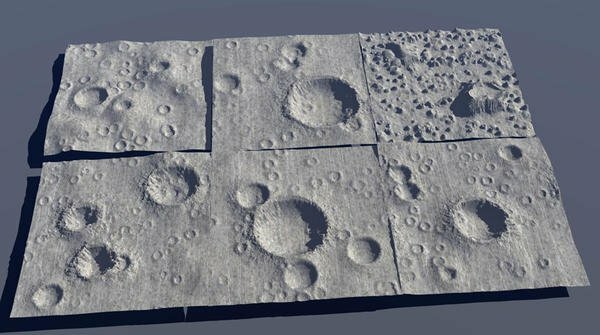 DAZ seems to have a package for DS3 (http://www.daz3d.com/shop/lunar-craters-moonscape/), however, I have no idea as to how good it is - but I’m sure that you could import the DS work into Bryce. Horo’s suggestion might be your best bet, I think, (I’ve seen a 1999 Peter Sharpe version, but it’s really a basic introduction to creating craters), if it’s just that you’re wanting to produce a simple moonscape. There are also several ready made 'crater' brushes for Photoshop, but you'll have to do a Google search for them as I don't have links to hand. Then you could paint your own lunar surface in Photoshop to import into the terrain editor. If you do that, make sure the image is in 16 bit greyscale and you are also edit in that. If you go for 8 bit, you get steps. @IanzThingz - thanks for telling us. This is good to know. The material applied in the first picture appears to create small craters suitable for viewing from a distance, using bump maps. 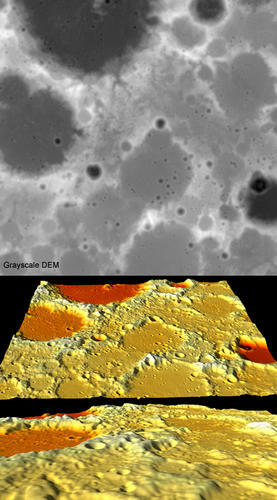 The material in the second picture is just something similar to the moon surface but no craters via bump. then added Noise and chose Veronoi (altitude) which gave the terrain for want of a better word bubbles all over the terrain. Next he added a filter node, then edited the filter, zeroed the line in the graph, this then flattened the bubbles but left the contours then double clicked on the graph line added some points which could then be moved up a little and this created the craters. Again thank you for the help. always appreciated. Well when it comes to unravelling the mysteries of the DTE David Brinnen is probably the best resource here in the forums. Even then though it's a very powerful tool capable of doing alot. From my limited knowledge of Bryce and what you're describing though it sounds like the terrain editor is where you should focus more of your energies. The idea you mentioned of making the black and white circles in GIMP and then using that as the starting point for the terrain editor sounds like a good idea although I'm not sure how exactly one would do that to get the final result of realistic looking crators. good luck though.